Myricetin is an important flavonol whose medically important properties include activities as an antioxidant, anticarcinogen, and antimutagen. The solubility, stability, and other biological properties of the compounds can be enhanced by conjugating aglycon with sugar moieties. The type of sugar moiety also plays a significant role in the biological and physical properties of the natural product glycosides. Reconstructed Escherichia coli containing thymidine diphosphate-α-l-rhamnose sugar gene cassette and Arabidopsis-derived glycosyltransferase were used for rhamnosylation of myricetin. Myricetin (100 μM) was exogenously supplemented to induced cultures of engineered E. coli. The formation of target product—myricetin-3-O-α-l-rhamnoside—was confirmed by chromatographic and NMR analyses. 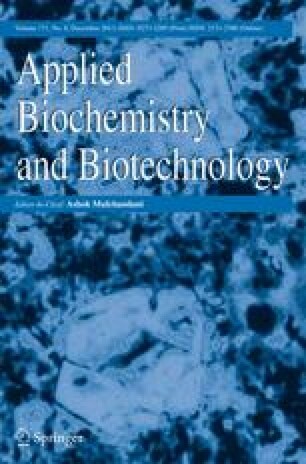 The yield of product was improved by using various mutants and methylated cyclodextrin as a molecular carrier for myricetin in combination with E. coli M3G3. The maximal yield of product is 55.6 μM (3.31-fold higher than the control E. coli MG3) and shows 55.6 % bioconversion of substrate under optimized conditions. The online version of this article (doi: 10.1007/s12010-013-0459-9) contains supplementary material, which is available to authorized users. This work was supported by grant from the Next-Generation BioGreen 21 Program (SSAC, grant#: PJ00948302), Rural Development Administration and supported by the Intelligent Synthetic Biology Center of Global Frontier Project funded by the Ministry of Education, Science and Technology (2011-0031960), Republic of Korea; grants from the National Foundation for Science and Technology Development—(NAFOSTED), Vietnam (Grant no: 104.01-2010.22).